Now that (nearly) all the grapes are picked the vendanges enter a new chapter. 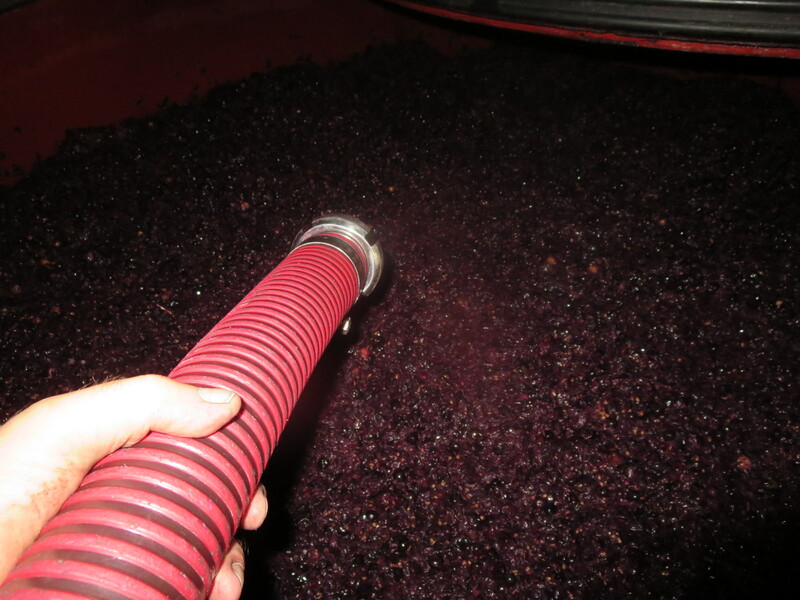 The grapes, bunches and juices are all in tanks in various forms and in various tanks or cuves. 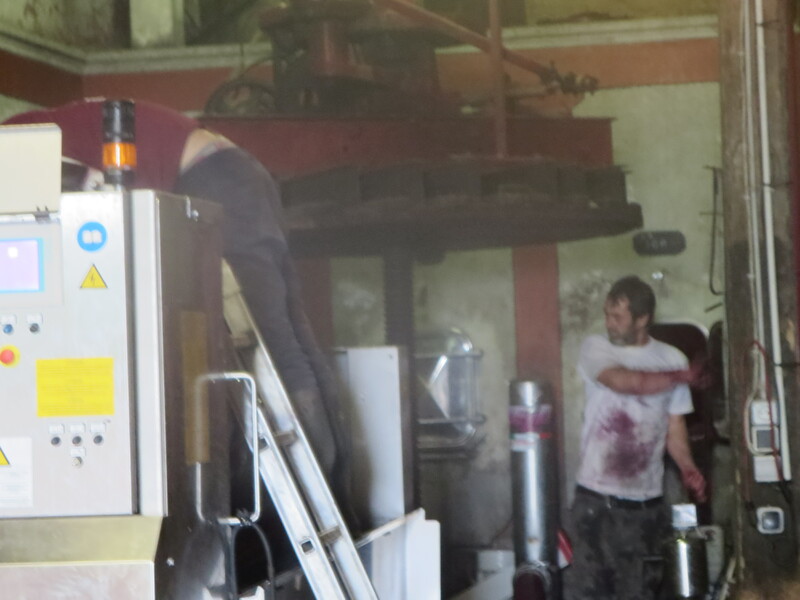 Some wines were pressed immediately, e.g. most whites, and the rosé after just a few hours on their skins to extract the rosé colour. 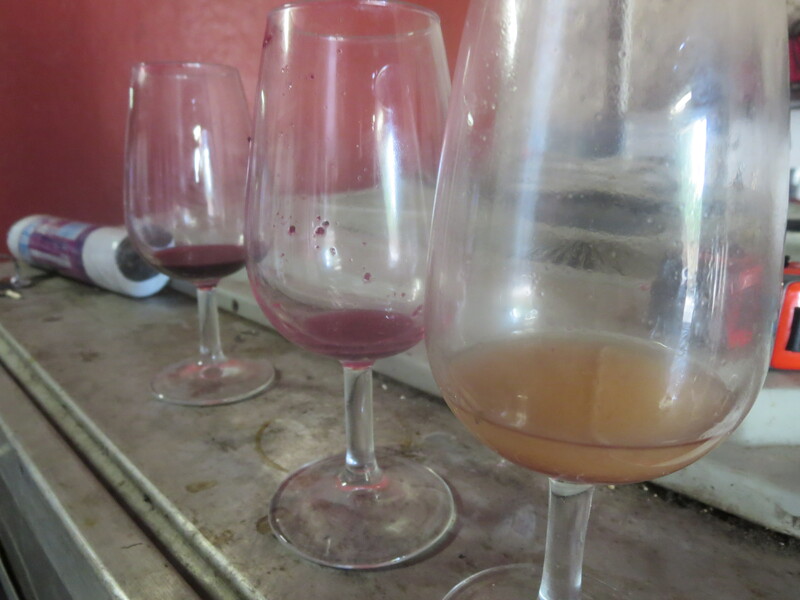 These wines now sit in their cuve and are fermenting gently, changing from grape juice to wine. The sugars are changing to alcohol and, naturally, the result tastes different. 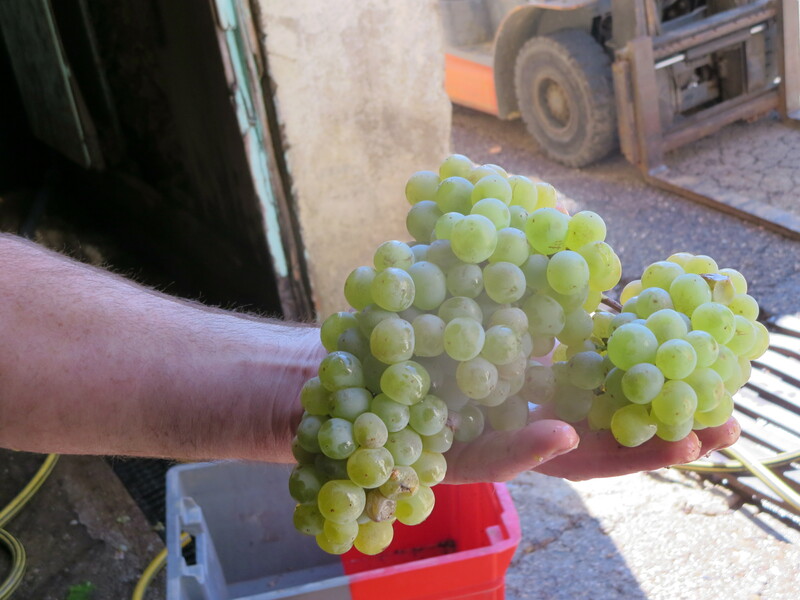 One of the most interesting things about the last fortnight has been to monitor the change in flavours from pure sweetness of fruit to a cleaner, drier, infant wine. The decisions which face vignerons such as Jeff now are about what to make of the wines. 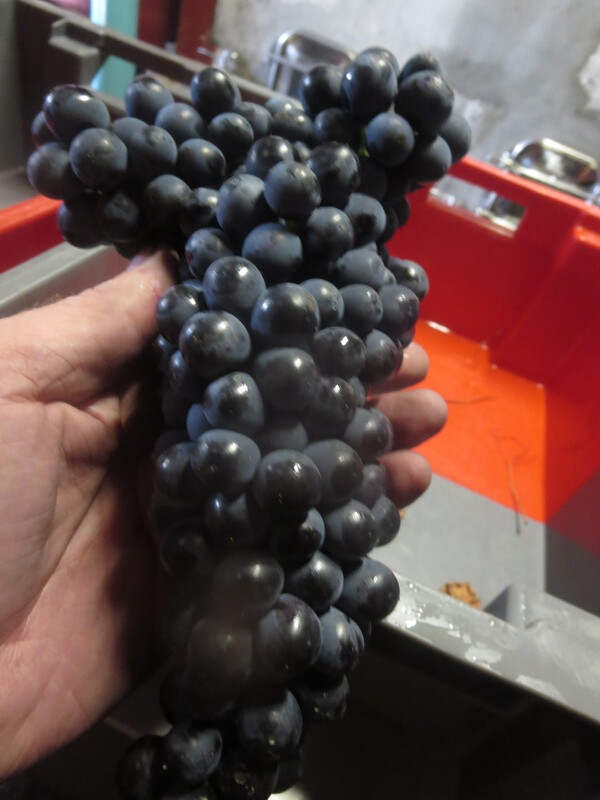 The reds could be made for aging with lots of tannins and colour extracted from the chapeau de marc, (the cap of grape skins, pips and, possibly, stalks) which is still in tank with the juice (also called the moût). Alternatively they might want a fruitier, more immediate wine and so the juice will be separated earlier from the marc. 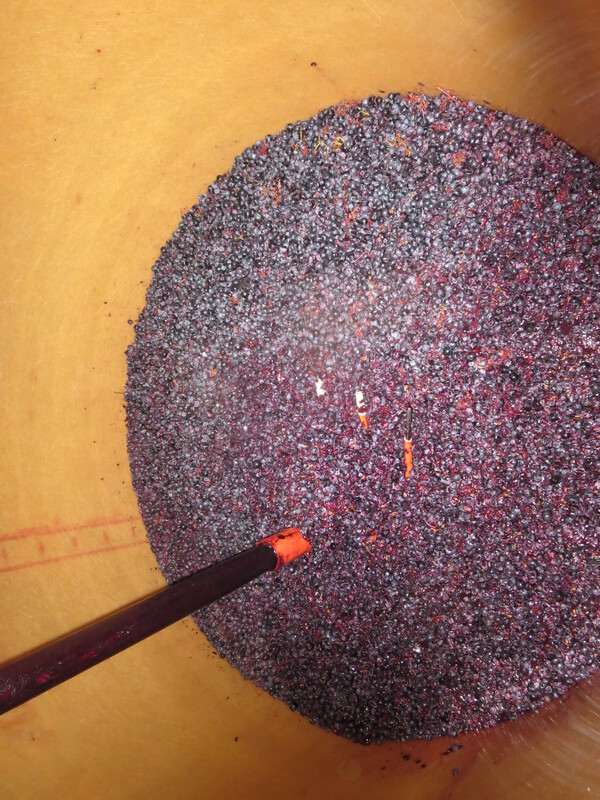 Processes such as pigeage and remontage, which I have mentioned before, help to extract colour, tannin and flavour from the skins. 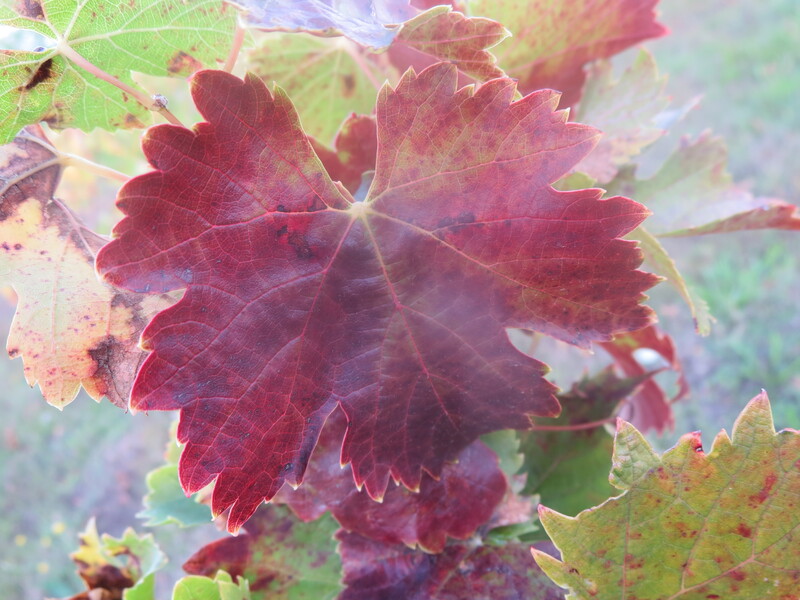 The marc contains chemical compounds such as anthocyanins which are what gives red wine its colour. To keep all of the juice in contact with the marc these processes can be used. Pigeage is where someone pushes the chapeau down, breaking it up into the juice by using tools such as a fork or even by using your feet. This can be dangerous, if you fall in there is a real risk of death due to the carbon dioxide being given off by fermentation. The chapeau does become incredibly tough and hard so it takes a real effort to carry out pigeage. I speak from experience. Remontage is the process of pumping the juice from the bottom of the cuve up and over the top of the chapeau, soaking it and allowing interaction between the chapeau and moût. Both processes also stop the chapeau from drying out on the top of the tank. 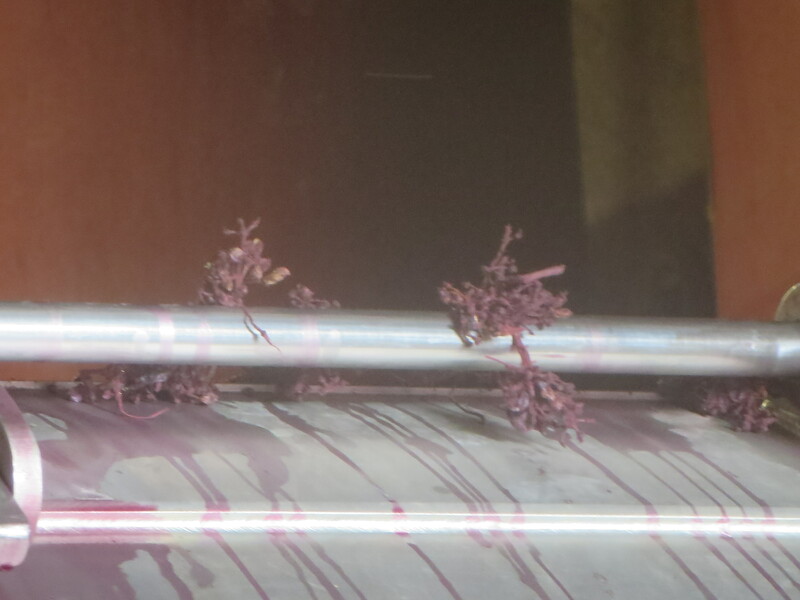 However, if you carry out these processes too often and too long you can end up with harder, more astringent wine. A decision has to be made about the style of wine you want. There is a third option, délestage, where the juice (moût) is pumped into a separate cuve and the chapeau settles in the original cuve. Its own weight causes some crushing and so when the moût is pumped back into the tank a couple of hours later it comes into contact with the pips etc from this crushing, having added extra weight to the chapeau when first pumped back into the cuve. 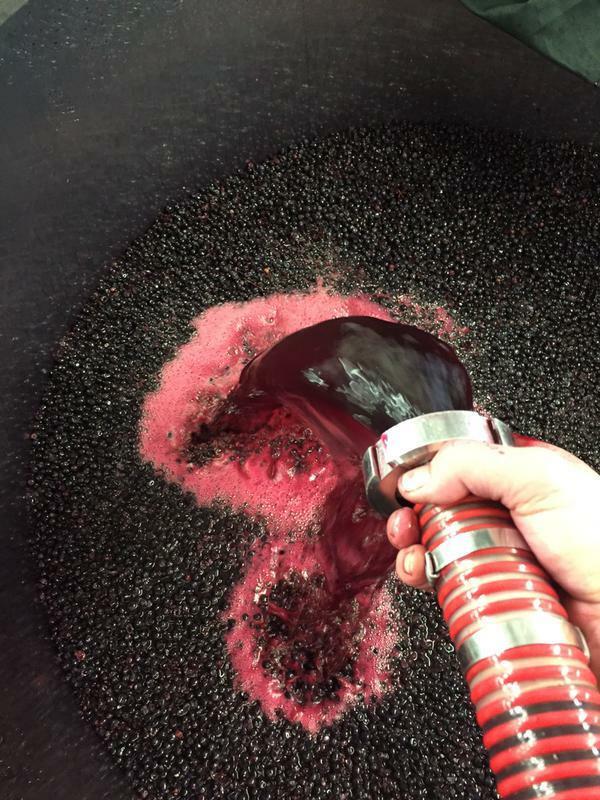 This process can produce a lighter, fruitier wine with a little more body. 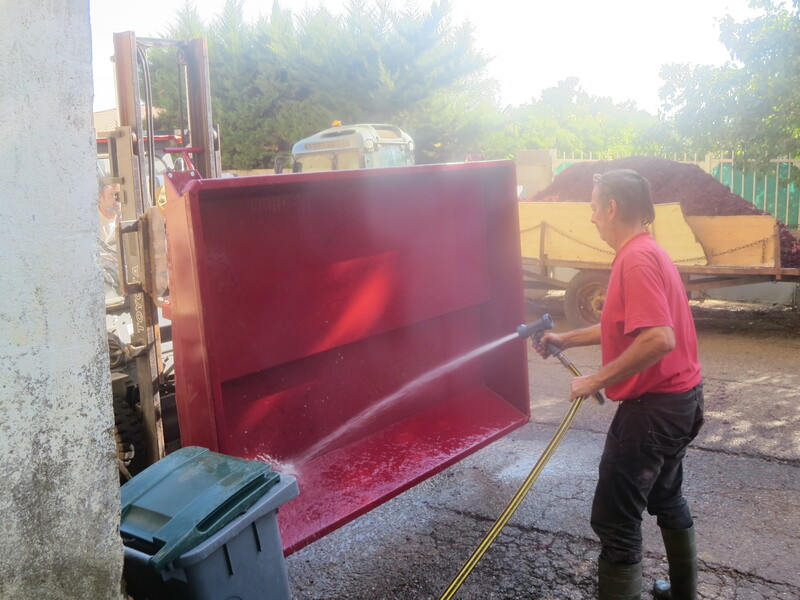 Jeff has used this for just one tank of Syrah, he thinks it can be harsher on the grapes. 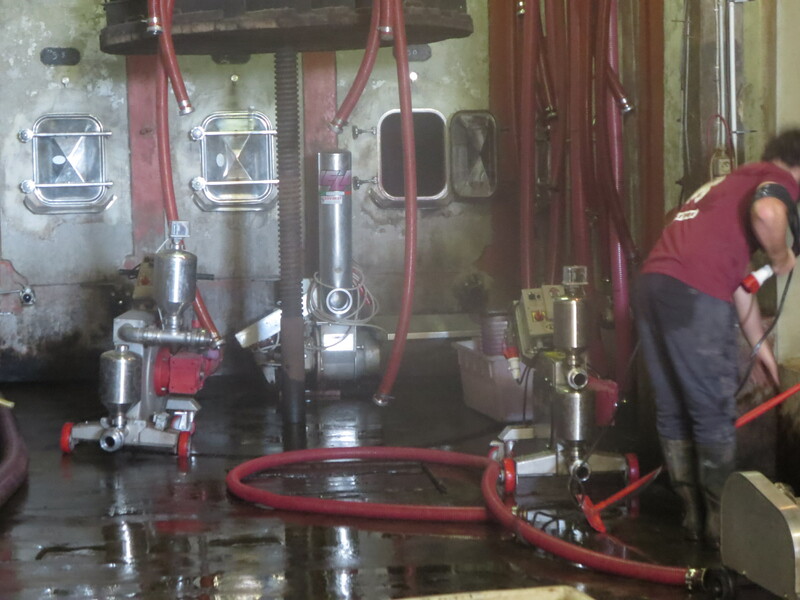 Pigeage and remontage are the more usual methods at Mas Coutelou. So, over the last week Jeff, Cameron and Michel have been very busy doing all of this work as Jeff decides which methods best suit the grapes which were harvested. The best fruit will stand more work but even that will suffer if overworked. As someone who wants the grapes to reveal their health and terroir Jeff would choose to do only what is necessary. 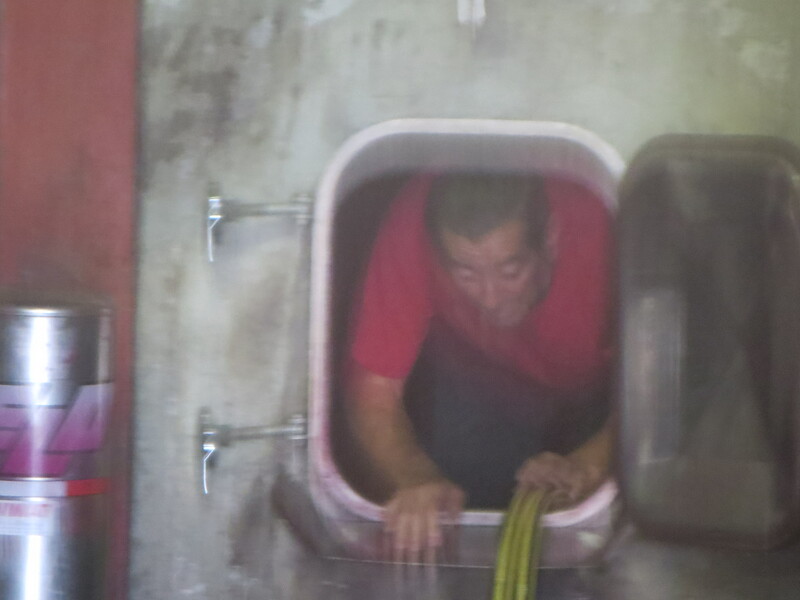 So, on Friday October 2nd the Grenache from Sainte Suzanne which were put into cuve as whole bunches (carbonic maceration) were pumped out and then pressed, a long day of hard work. Pumping juice, lifting out the marc by fork and shovel, pressing the marc, sending the juice to a new tank. 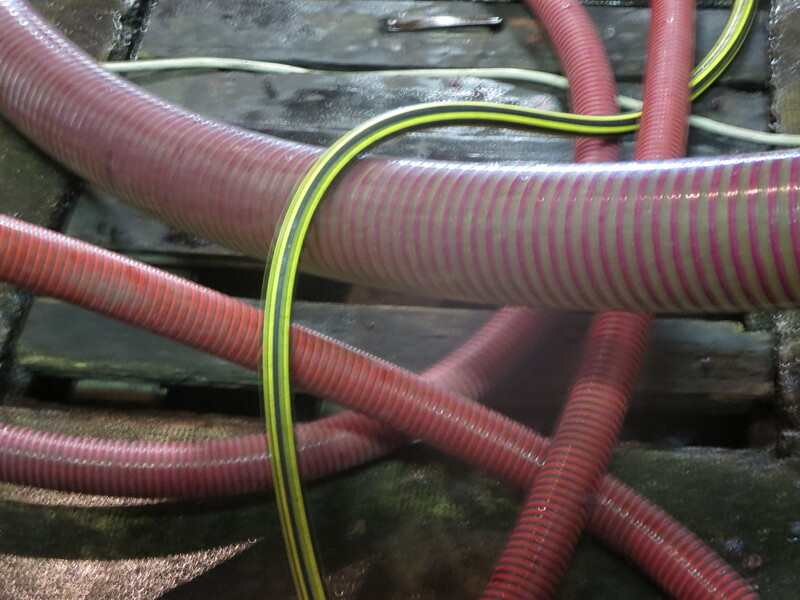 This was one day of many, the same processes repeated many times and between each one … lots and lots of cleaning, to reduce any risk of contamination and spoilage. The Mas Coutelou name continues to expand globally, visitors to the cellar on Friday came from Sweden and Canada. There have been others in recent weeks from the UK, Australia and other regions of France. 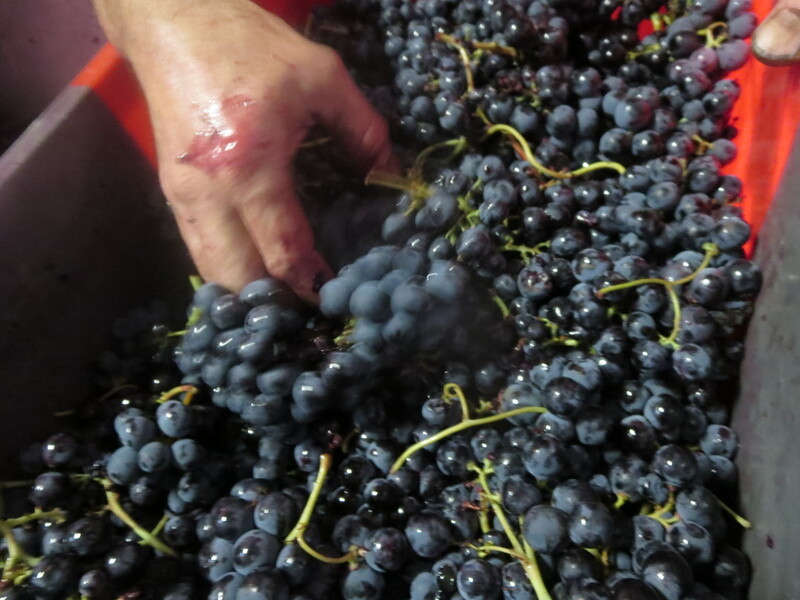 Selling the wine which is being made is another aspect of the whole process. 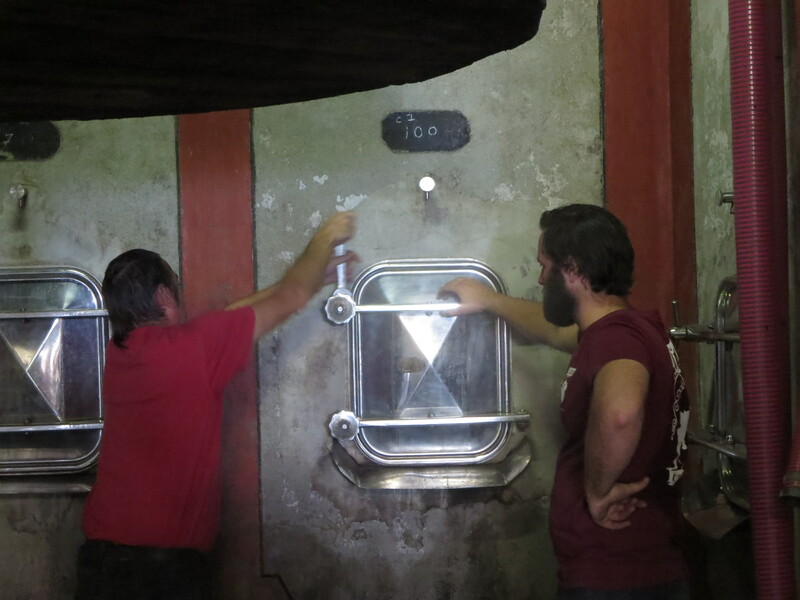 Other work last week included sorting the solera cellar on Wednesday October 1st. Wines were moved and blended, barrels were emptied and filled – more complexity for Jeff to get his around. 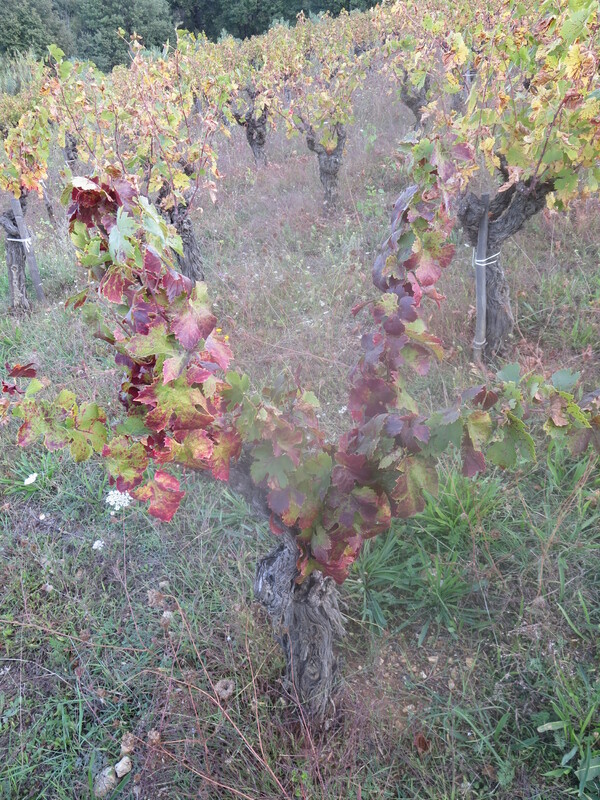 A vineyard visit also unveiled a few rows of Grenache in Saint Suzanne which had not been picked. 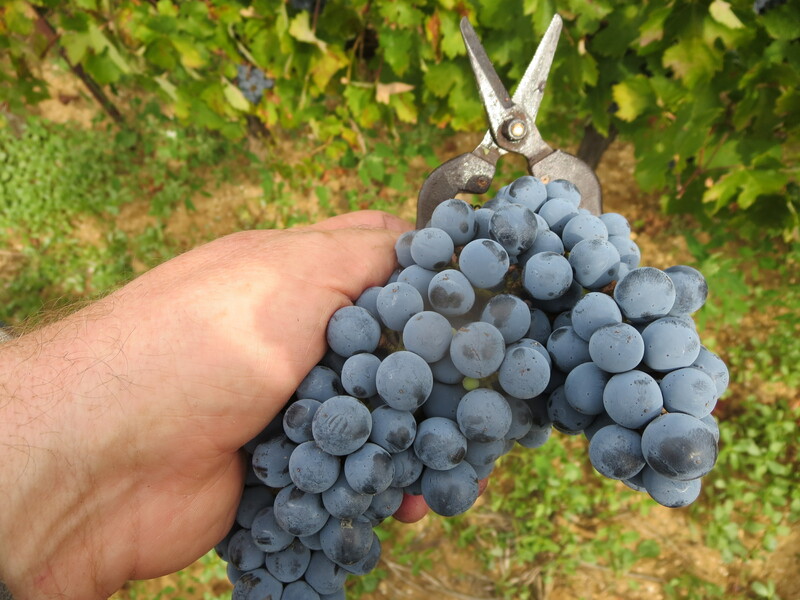 The grapes are starting to shrivel and concentrate their juices, possibly to be blended with the Muscat of Rome vineyard which are now well on the way to being dried out. 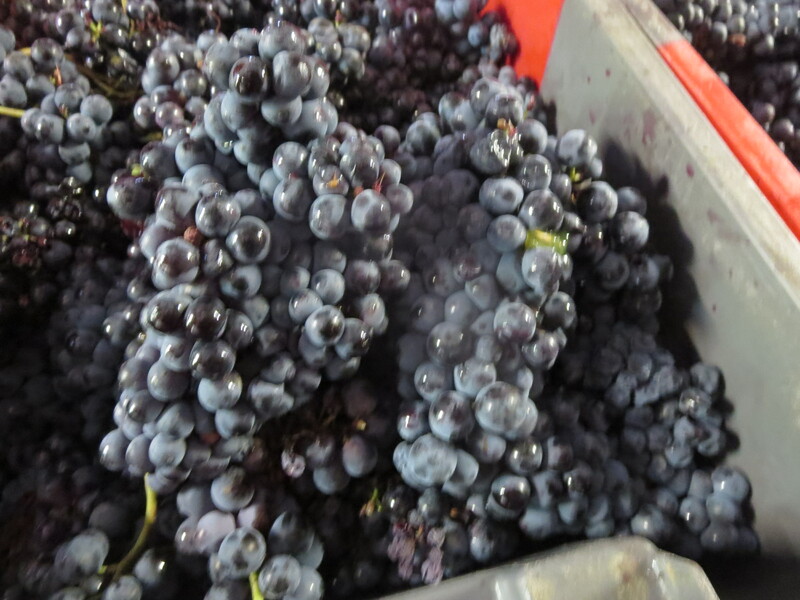 These grapes now taste like raisins, sweet but with not much juice so the Grenache would give volume. Rain which fell on Saturday, 3rd might change this plan, we shall see. The Grenaches of my 100th blog post are progressing well. 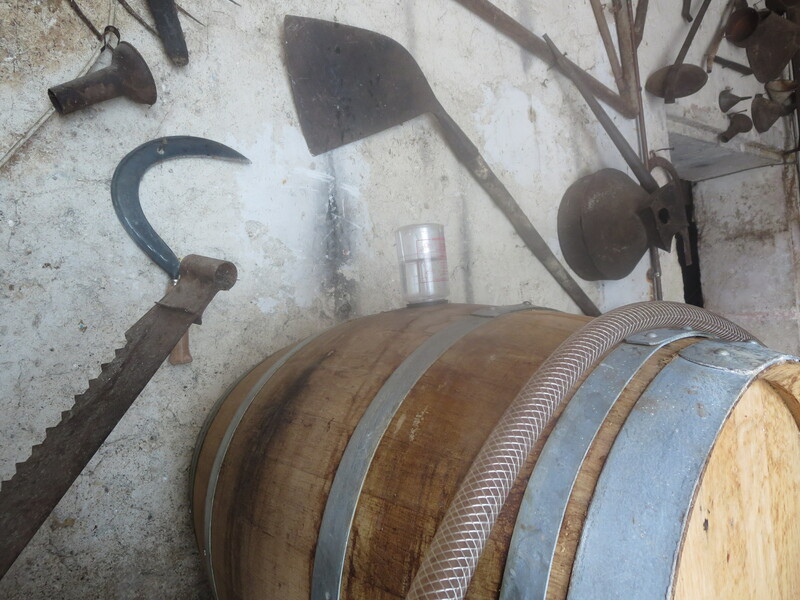 The barrels were racked to take the wine off the lees and leave a clearer wine. The smaller barrel was more cloudy than the big barrel, possibly due to it being pressed earlier but everything is going well and they now continue their slow fermentation. The 27l bottle stands in the main cellar and the fermentation is still bubbling through the equipment given to me by my friend Barry when I left the UK. I tasted the wines today (Monday 5th). 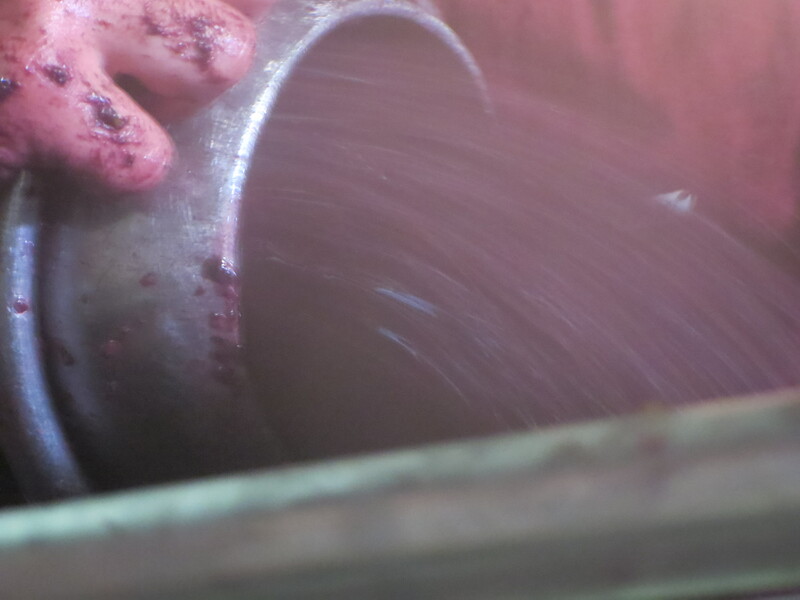 The bigger barrel produced a fruitier light red wine with the sugars still obvious. The smaller barrel was a little darker, with more texture and drier. Fascinating to see them adopt different personalities at such a youthful stage. 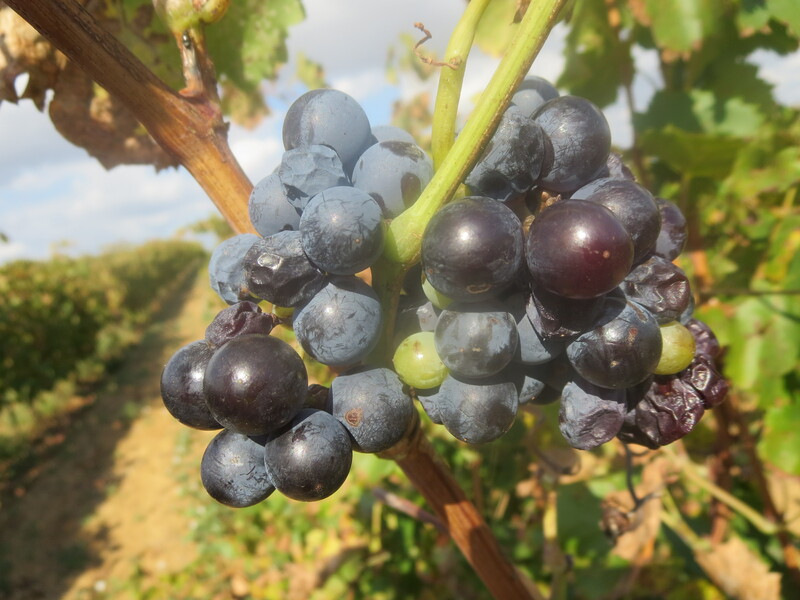 The team from London Cru tweeted to say that the Cabernet Sauvignon which they took back to London is really starting to show well as you may see from this photograph of remontage. 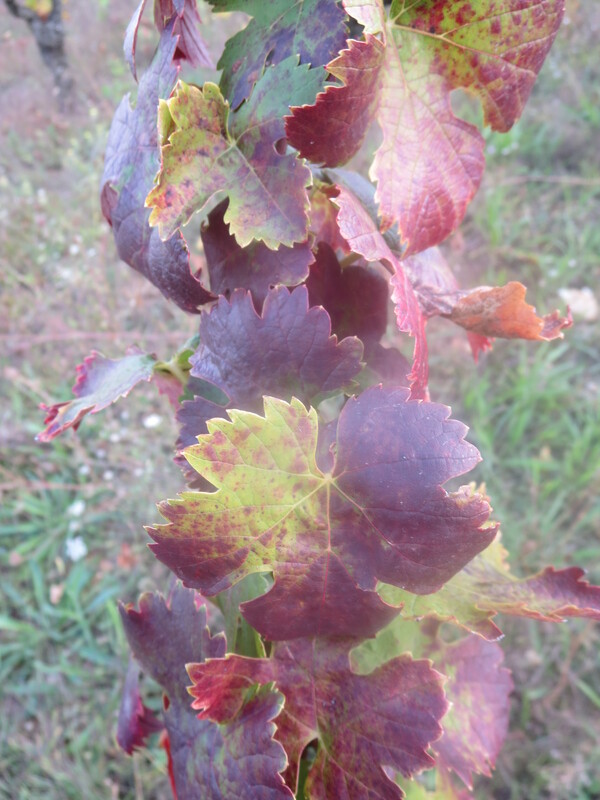 Meanwhile back in Puimisson autumn is really starting to show in the colours of the vines, they are stunning at present. The partridge family were waiting for me as I visited Rome on Friday, hopefully they will survive the hunting season which is getting under way in France. 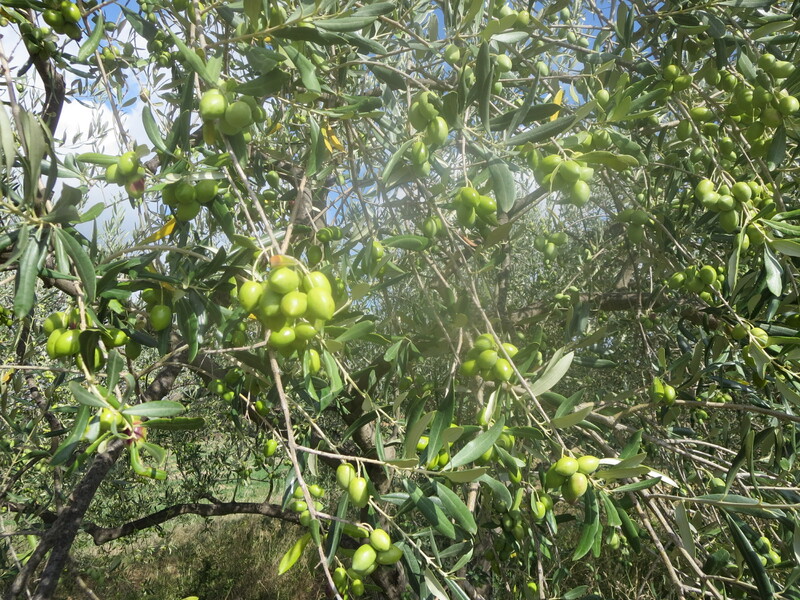 The olives are also ripening in some of the groves, these were in Sainte Suzanne on Friday. 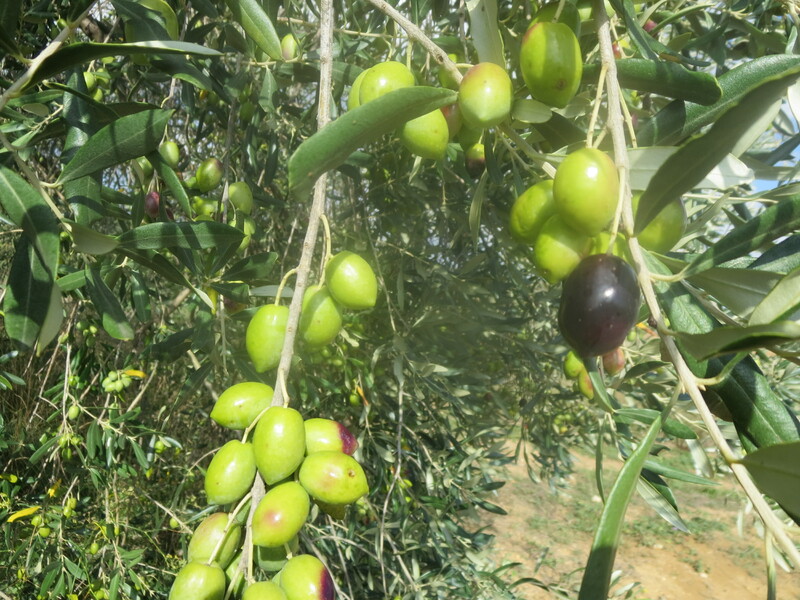 Unfortunately the olive flies which damaged so much of the harvest across southern France last year have been causing damage again in other groves. And one hungry member of the team can be relied upon to brighten up any day. Categories: Vignerons, Vines, Wines | Tags: anthocyanins, chapeau de marc, délestage, Grenache, London Cru, mout, pigeage, Puimisson, remontage, vinification | Permalink. Really interesting, as always. Our big day is Saturday. We have to pick, press and vat as much as we can as we only have access to the press that day. Planning to make white wine with no intervention, no added yeast, no sulphur. And I do not really have a clue. Will try one small vat with skin contact. 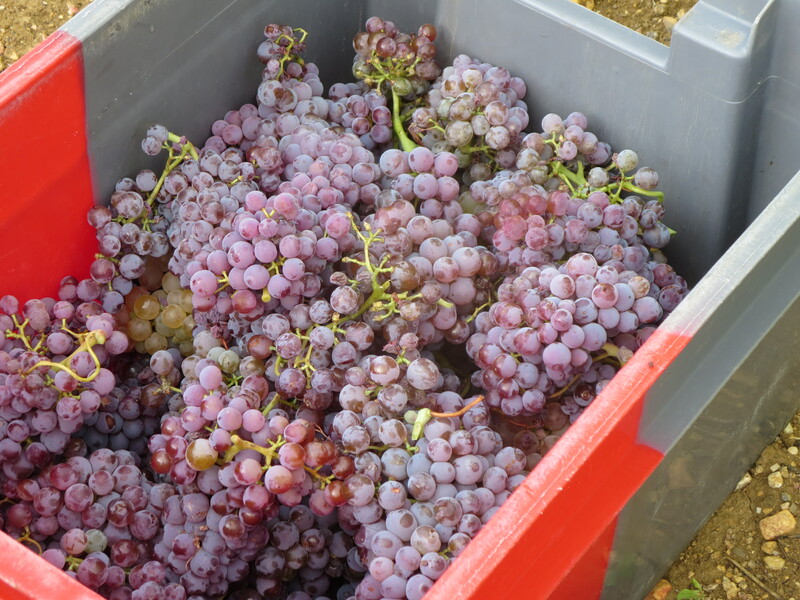 Four or five sentences on how to make white wine gratefully received…but the red grapes picked so far have made lovely grape juice. Curious to know where these vines are and the variety David? Graham, they are Seyval Blanc (we, and Twitter, think! ), and they are on the South Coast of England. Hoping that they are still there on Saturday, and don’t get pinched like those for Guigal’s expensive Viognier dessert wine were the other day. Got some emergency yeasts sorted in case ferment won’t start. Even possibly going to try for some pét-nat, though even some proper winemakers I know have failed there. Worth a go, though. 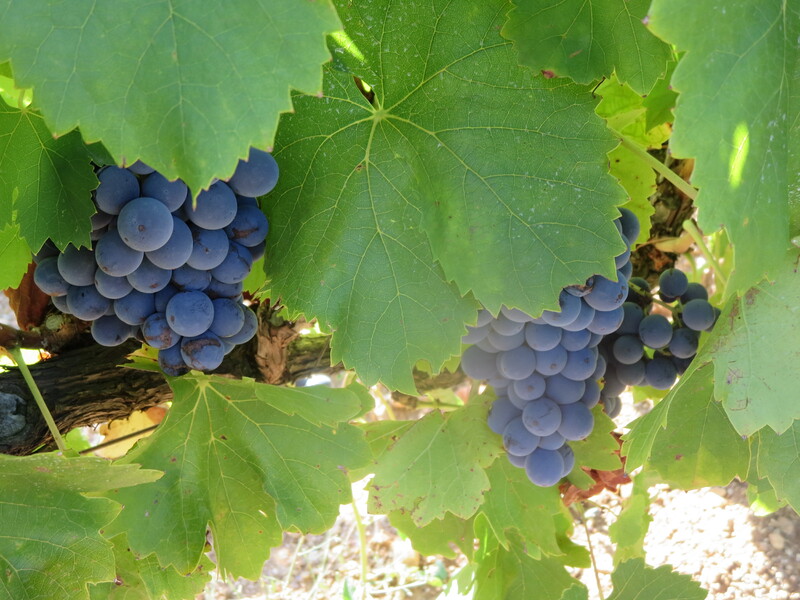 Regis at Domaine Ribiera Aspiran has some Grenache waiting to be picked for a Vin Doux Naturel. It isn’t going to ripen enough the way things are going so a Cartegene is going to be made. Last year it was written off by the rain at the end of September. The whites we had included one small tank (40hl) with extended skin contact, I put up a photo of is doing a pigeage with our hands. 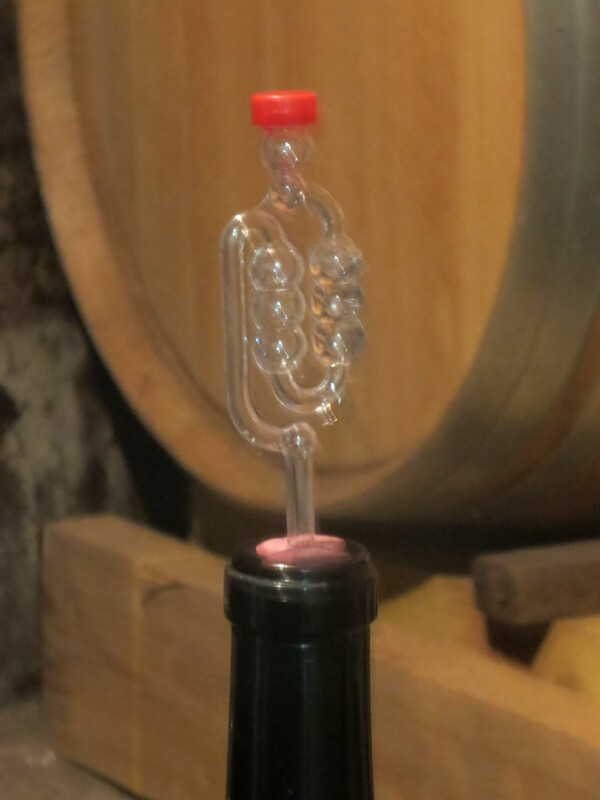 Otherwise as ever quickly pressed, allow a hint of oxidation to protect it later. 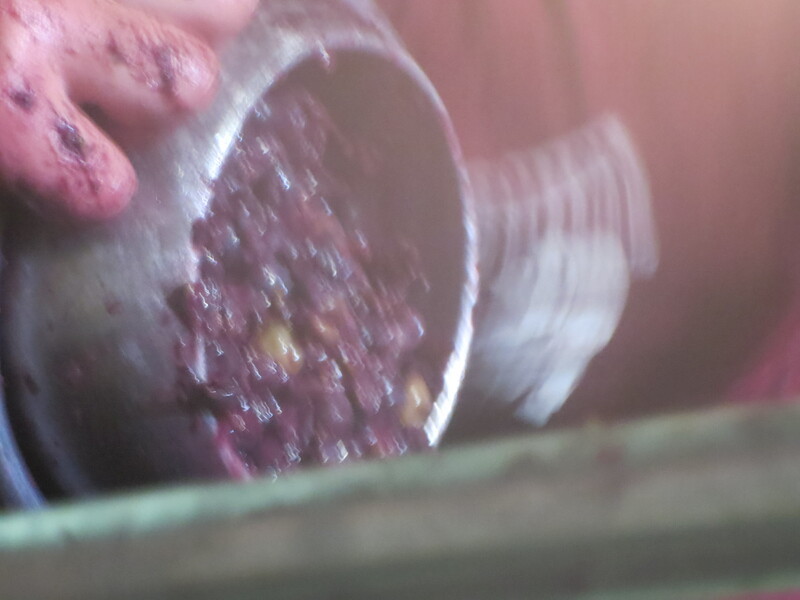 Then into cuve and a décuvage after 2 or 3 days to get rid of sediment etc. Fermentation was no issue down here, I guess it could be in England. No batonage for the skin free white. The photo in this post shows a glass with a little of the macerated white in it, still a little cloudy and it was picked around August 24th or 25th. It is clearing though. We are picking the last grapes tomorrow and I shall ask about any further guidance, the message as ever is trust in your grapes. 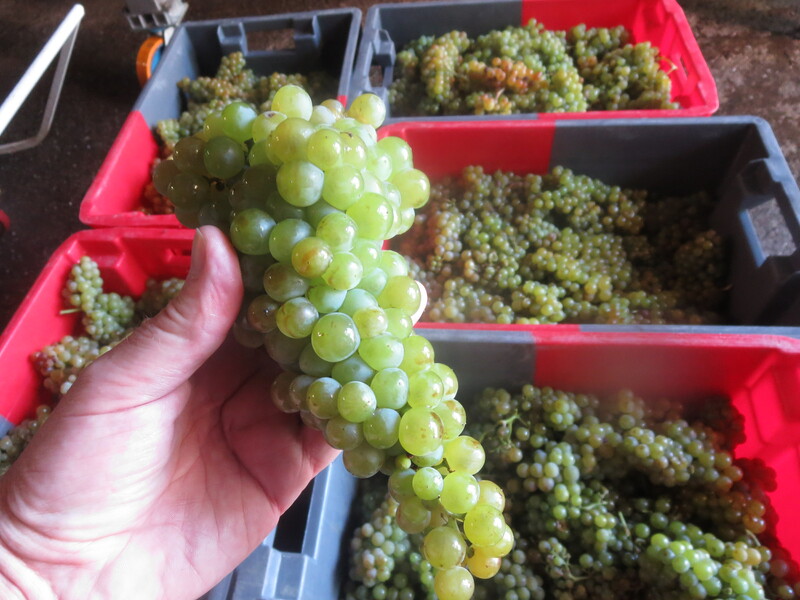 White grapes with extended skin contact = orange wines in some parlances. That was the first thought but in the end the contact was halted to leave a very textured, really delicious white wine. Skin contact can vary. I tasted orange wines from Germany and Austria yesterday and the contact for one was 3 weeks, the other 40 days. 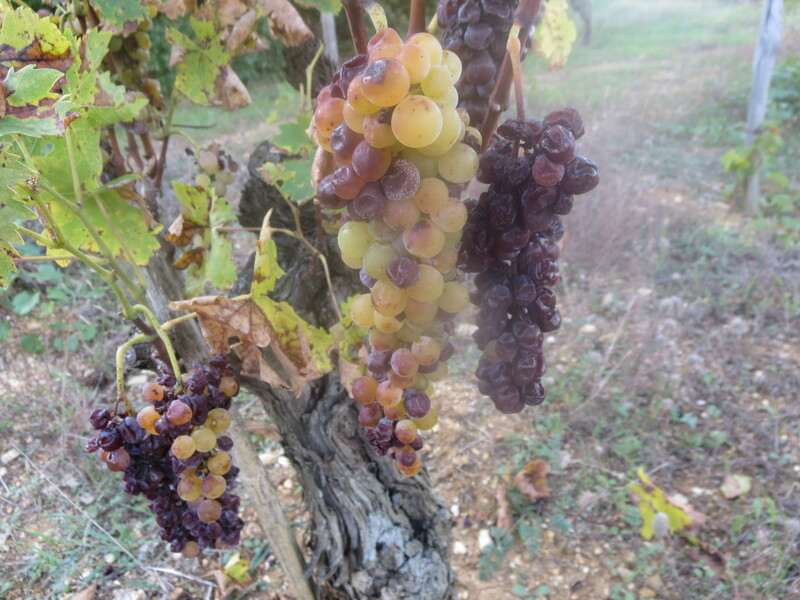 I’ve seen orange wines in the Jura this autumn which have been gently bubbling for a very long time indeed. Some people see it as a fashion, albeit one with its roots perhaps even in pre-history, but I like them. Sadly no access to an amphora, though a trip to a garden centre for a small terracotta urn is an idea I can only just resist. David, I was at the French conservatory of vines this morning with a growing database online. I’ll post soon with details so you could check your Seyval. Hi Alan. Wondered what you have been up to since retirement. Sounds wonderful. I think Philip and myself are long overdue a trip to France!